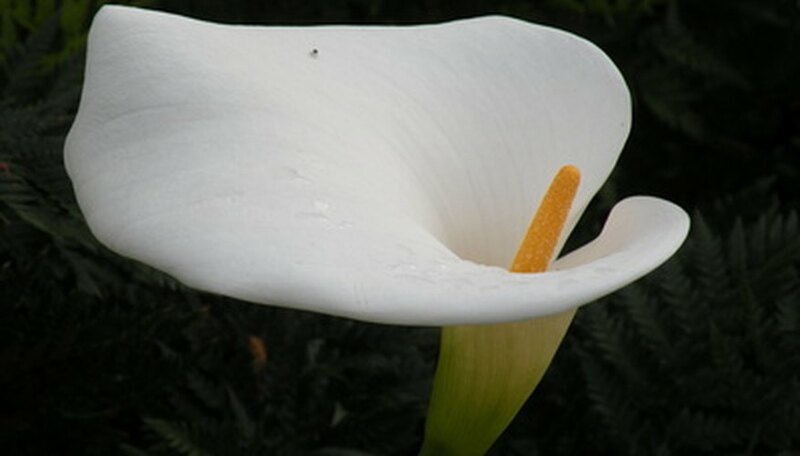 While calla lilies are not really part of the lily family, their exotic-looking blooms bring to mind the lily plant. As a tender bulb, calla thrive in summer gardens and outdoor pots, but they must be brought indoors before fall frost in areas with cold winters. Calla bloom in colors ranging from white and pink to orange and yellow, flowering throughout the summer months. Lay a 2- to 4-inch layer of compost over the garden bed prior to planting and work it into the top 6 inches of the soil. Compost helps retain moisture. Use a peat or compost-rich potting soil for container-planted calla. Water calla once weekly or more often as necessary to keep the soil moist. Water at the base of the plants until the soil feels moist to at least a 6 inch depth when you stick your finger or a spade into it. Water container plants once daily or when the soil surface begins to dry, irrigating from the top of the pot until the excess moisture drains from the bottom. Lay a 3-inch layer of organic mulch, such as bark or wood chips, around the calla plants in the garden bed. Mulch preserves soil moisture between waterings. Place potted plants in an area where the pot is in the shade but the leaves and flowers receive full sun, such as near low walls or shrubs. This helps prevent evaporation of moisture from the pot. Water calla after blooming has stopped and once the foliage begins to die back or go dormant when the top 2 inches of soil begin to feel dry in either the pot or garden bed. Water until the soil is thoroughly moistened in garden beds or until the excess water just begins to drain from the bottom of the pot. If you dig up and store calla bulbs in peat moss over winter, there is no need to water. Calla flower best when planted in full sun, which can lead to more frequent drying of the garden bed. Avoid planting in clay or cement pots as these whisk moisture away from the soil too quickly. If you prefer these types of pots, use a plastic liner inside them to prevent them from drying out to quickly.